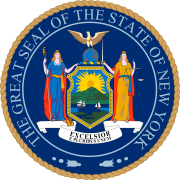 The 1873 New York state election was held on November 4, 1873, to elect the Secretary of State, the State Comptroller, the Attorney General, the State Treasurer, the State Engineer, a Canal Commissioner and an Inspector of State Prisons, as well as all members of the New York State Assembly and the New York State Senate. Besides, the voters were asked if the judges of the New York Court of Appeals, the New York Supreme Court, and the county and city courts, shall be elected or appointed; the electorate decided to maintain the elective system. The Republican state convention met on September 24 at the Opera House in Utica, New York. David J. Mitchell was Temporary Chairman until the choice of Stewart L. Woodford as President. Francis S. Thayer was nominated for Secretary of State by acclamation. The incumbent Comptroller Nelson K. Hopkins was re-nominated by acclamation. Daniel G. Fort was nominated for Treasurer after a "rising vote, when the whole convention, except a score, stood up in favor of Mr. Fort." Benjamin D. Silliman was nominated for Attorney General on the first ballot (vote: Silliman 262, B. Platt Carpenter 162). The incumbent State Engineer William B. Taylor was re-nominated. Sidney Mead was nominated for Canal Commissioner on the first ballot (vote: Mead 185, Charles K. Monell 118, John Napier 41, Hiram P. Wilbur 33). Moss K. Platt was nominated for Prison Inspector on the first ballot with 238 votes. The Democratic state convention met on October 2 at Utica, New York. Diedrich Willers, Jr., for Secretary of State, and Asher P. Nichols for Comptroller, were nominated by acclamation. Daniel Pratt was nominated for Attorney General on the first ballot (vote: Pratt 82, James B. Olney 26, Rufus W. Peckham, Jr. 13). The incumbent Treasurer Thomas Raines was re-nominated by acclamation. Sylvanus H. Sweet was nominated for State Engineer after several ballots. James Jackson, Jr. was nominated for Canal Commissioner, and George W. Millspaugh for Prison Inspector. Five Democrats and two Republicans were elected to state offices. The incumbents Hopkins and Raines were re-elected. The incumbent Taylor was defeated. ^ Raines had been elected on the Republican ticket in 1871, had joined the Liberal Republicans in 1872, and ran now on the Democratic ticket.